Quantum numbers are values that explain the movement of electrons within an atom. These numbers, as their name suggest, are heavily influenced by quantum mechanics, a branch of physics that deals with the movement and behavior of subatomic particles. There are four of these numbers – the principal quantum number, the angular momentum quantum number (also known as the orbital quantum number), the magnetic quantum number, and the electron spin quantum number. Each of these quantum numbers cover a quantum mechanical principle, and, together, forms the basis of the branch. These quantum numbers also define electron configurations – an important concept in chemistry. These configurations define how an electron is distributed within an atom. In terms of quantum numbers, the electron configuration represents the amount of electrons that can fill an element. The most stable elements – the noble gases – have the maximum amount of electrons allowed by their quantum numbers. Both the electron configuration and the quantum numbers of elements are determined by the energy that electrons have. The electrons with the lowest energy which are closest to the nucleus are referred to as core electrons while those with the highest energy are labeled valence electrons and are used to increase atomic stability through chemical bonding. The Principal Quantum Number, represented by the letter n, is used to define the energy level of the electron in any atom. In chemistry, the electron’s energy level is also referred to as the energy shell. As previously stated, the core electron shell is that with the lowest energy and, therefore, would have a lower principal number. Since atoms have a tendency to fill their lowest energy shells first, the lowest principal numbers are where we start. The electron shells are labeled in two ways – alphabetically from the letter K to O or numerically from the letter 1 to 5. These are equivalent; K is the same as 1 and O is the same as 5. Typically, this quantum number is represented numerically instead of alphabetically. Although there is the chance that higher principal quantum numbers may be used, n = 1 to n = 5 are the most common range. The Angular Momentum Quantum Number, represented by the letter l, is also called the Orbital Quantum Number because it determines the path or area that the electron travels within, which we define as an orbital in chemistry. Orbitals are governed by an electron’s angular momentum, which is the physical product of an electron’s moment of inertia and its angular velocity. In spite of this, it is important to note that calculating the angular momentum of an electron cannot be done conventionally because the electron exhibits wave-particle duality, which is the nature of a particle to behave like both a waveform and a particle. As such, the angular momentum in a quantum mechanical sense is often referred to as the quantized angular momentum. Regardless, the angular momentum quantum number, l, is also represented both numerically – commonly by an integer value from 0 to 3 – or alphabetically – with the letters s, p, d and f, respectively. Unlike the principal number’s convention, this quantum number is typically referenced with its letters. As with the principal quantum number, the value of l can be greater than the commonly used range, however the elements that correspond to greater l values have not yet been discovered. Moreover, the orbital quantum number is limited by the principal quantum number in that l must always be one less than n. In other words, the orbital quantum number can only go up to n – 1. This means that if there is a principal quantum number of 2, the orbital quantum number is equal to 1. The result of that is that the highest orbital in the element is a p orbital. That, however, does not mean that all electrons are within the p orbital. Remember, electrons prefer to fill the lowest energy shells before moving to the next one, meaning an l of 1 means that there are electrons both in the s and p orbitals. It is because of this that when a principal quantum number is given, the value of l given is usually the range of possible values; n = 2 corresponds to l = 0, 1. While the principal quantum number tells you how many electrons are contained within the atom, the orbital quantum number will tell you how they are organized within each electron shell. Therefore, this quantum number defines the electron “subshell”. Every electron within the same subshell contains the exact same level of energy, and, just like with electron shells, the higher subshells contain more energy than lower subshells. With an increase in the number of electrons comes an increase in the amount of orbitals and how they must be oriented to maintain the lowest possible energy within an atom. The magnetic quantum number, represented by the letter m, provides a value to this orientation. 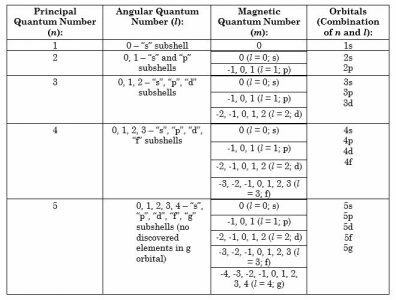 Keep in mind, however, that since this depends upon the number of subshells, it is limited by the angular momentum quantum number. That said, m is equal to the range of -l to l. So, for example, if there are two subshells, represented by l = 1, the value of m is 3 (-1, 0, and 1). This means that there are 3 orbital orientations in the highest subshell. In order to find the total value of m, however, you must remember that an l of 1 includes l = 0. In that case, m is equal to 1, making the total amount of orientations in this element 4. The spin quantum number, or s, is the final quantum number and is also the only quantum number that has no dependence on any of the other quantum numbers, but instead depends on the quantum mechanical properties of electrons themselves. This number determines the number of electrons within any given orbital orientation, as per an important quantum mechanical principle – the Pauli Exclusion Principle. It states that two electrons cannot have the exact same quantum mechanical state. This state is according to a quality that electrons have called “spin” (the electrons do not literally spin, this is just a name) which is either defined as +1/2 or -1/2. In one orbital orientation, according to the Pauli Exclusion Principle, there cannot be two electrons with the same spin. Therefore, the spin quantum number dictates that there is a limit of two electrons, one with one spin and one with the other, in any given orientation. 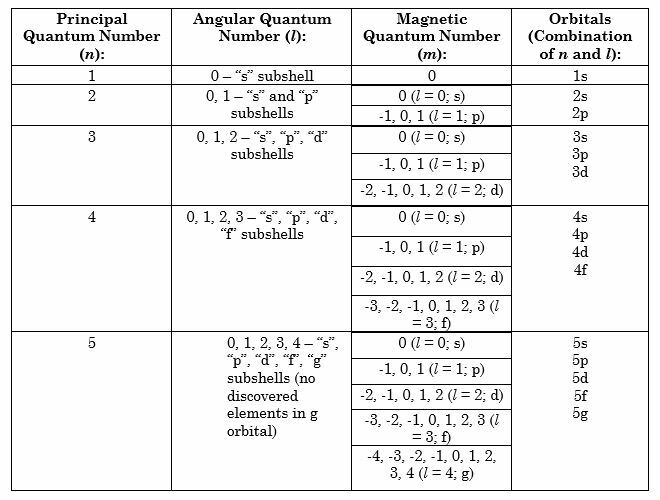 The amount of electrons in any given element is represented with a 1 or 2 in exponent form on the angular quantum number, representing if that element has one or two electrons in that subshell. 1. What do quantum numbers do? A. They explain quantum mechanics. B. They explain the electrons’ charge. C. They explain electrons’ movements. 2. What does an element having a principal quantum number of 2 mean? A. There are three subshells. B. There are two shells. C. There are four orbital configurations. 3. How many orbitals does an element have if it has an l value of 2? 4. If an element has an l value of 2, how many electron shells do we have?